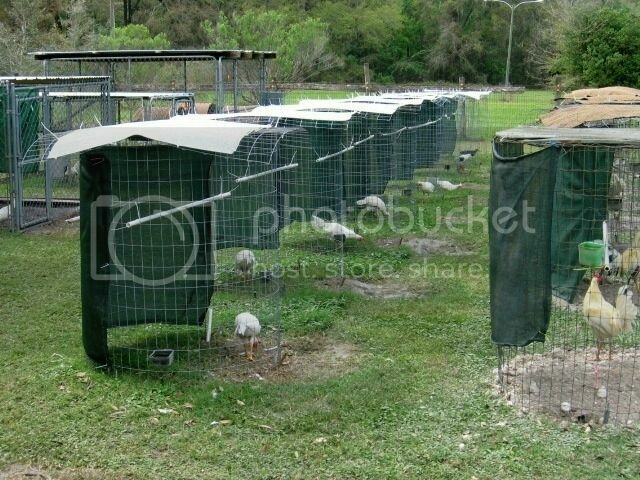 building round pens are dicatated by the fact that you can only get the wire in 3', 4', 5', or 6' in height. the diameter you want them is determined by you. 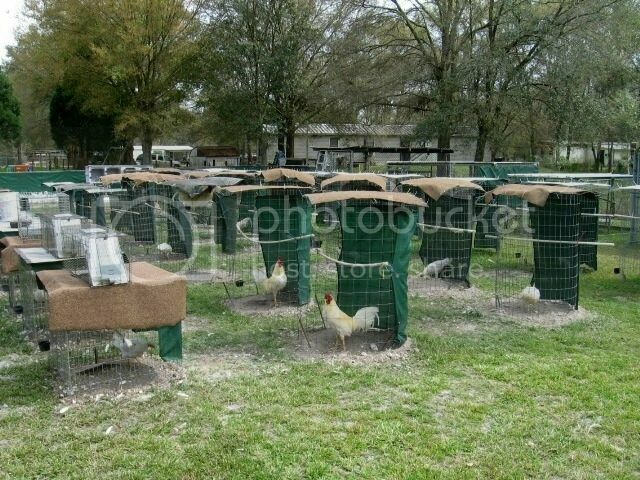 they are nice because a roosters doesn't have a corner to stand in and he keeps moving good in them. putting a top/roof on them is a pain. Round pen in my opnion are a pain. 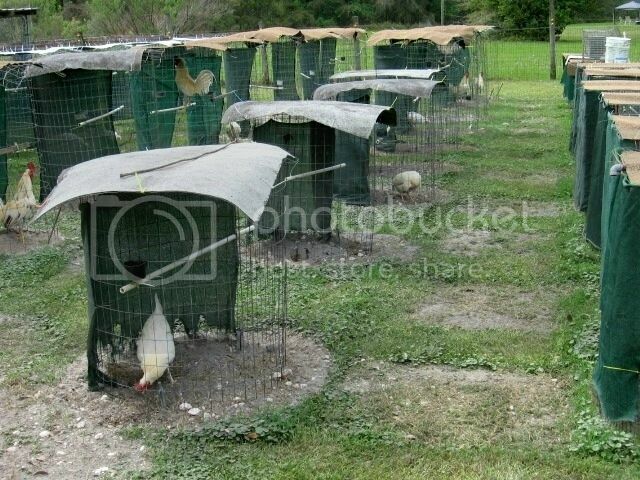 They blow over, they are hard to cover and get birds out of. Dome pens are simple and there is a lot more groung space for the birds you can make them in several difrent sizes and they will not blow over or fly like a kite. heres a pic. of a few of my 3' wide 8' long angd 28'' tall dome pens they also woork great for a run pen. Just built 4 dome type pen. My base is a pressure treated lumber 2"X4"X4' and 2"X4" mesh wire 4'X10' long. Staple both end of wire on the wood base. I also put 1/2" X 10' PVC inside on both ends of the dome plus 1 on the center to suport the wire so it can stand the weight of the snow just in case of heavy snow falls. The PVC will look like an arc inside the dome pen. Thanks, hope it helps. Note : See Reds & Greys picture of dome pen. Mind got 3 PVC inside the dome pen 1 on both ends and 1 at the center. My roost is 26" above the ground. Last edited by RF Stallion; May 24th, 2011 at 01:04 AM. Little info on roundpens (see attached). 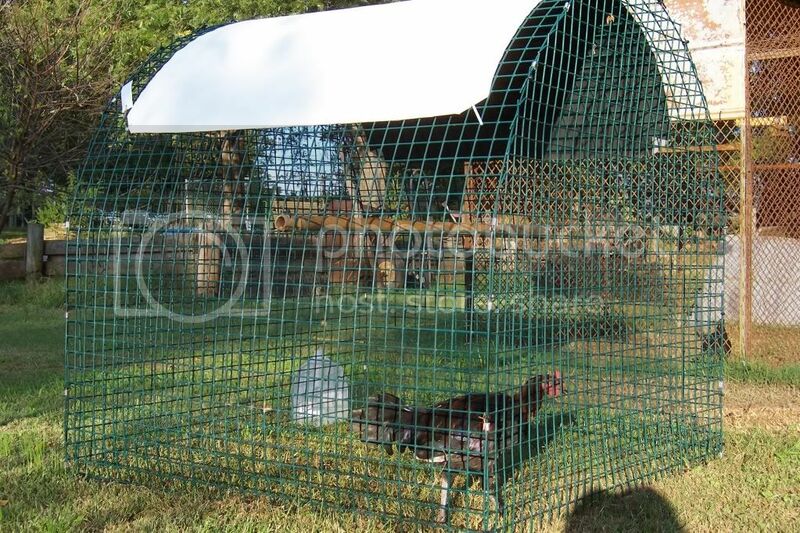 I saw a good way to build around pen at a friends farm where he took a 3ft hog panel and bent it into a circle then wrapped it in chicken wire. They are a pain to put a top on but they do not need staked down and are very sturdy. Use 2x4 12 Gauge wire cut it to 12 feet long. Form it round and connect the ends overlapping 2-3 squares. Then get a ply wood 4x8 and put it on top of every two pens and tie the plywood down and add a rock or block in the middle of the ply wood. This is how we have them and they have never have even budged in the wind. I use the 4' tall 2"x4" wire cut 12'. A 50' roll make 3 pens. I stake the bottom in 6 different places and put strip of rubber mat on top. I don't tie the rubber mat on top so if the wind blows it won't turn the pens over. Heres a pic. I made hoops using 1" poly-pipe and attached them to the bottom of the round pens I made so the pens maintain a nice cylindrical shape at the bottom. 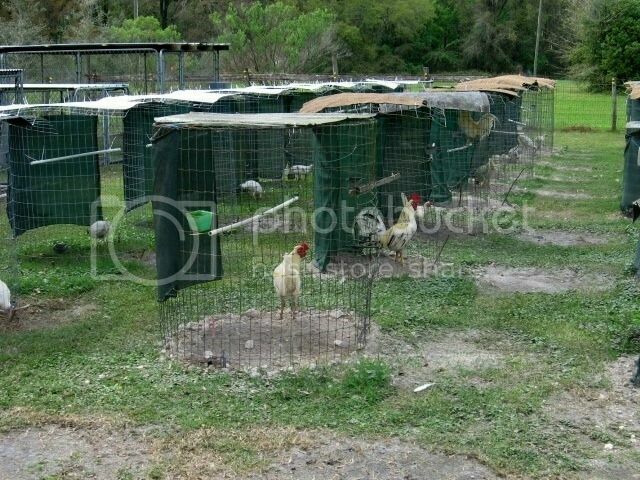 They are easy to drag from one place to another to keep the roosters on fresh ground. A guy can also use rebar to make the hoops. I bought a roller to roll the hoops I used on some large round wire pens. I made some 6' diameter X 6' high wire pens using 72" wire with a rebar hoop at the top and bottom and with 3 vertical stays with rebar. They are real nice. I also know how to weld. Last edited by Camarines; July 30th, 2011 at 11:12 PM. 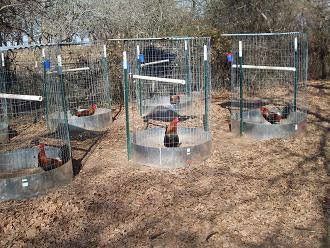 i make 5 pens from a 50 ft roll space them about a foot apart.i had some hardware left from a chain link fence i run the poles thru the cages for a roost and connected them to a pole on each end so it cant blow over. 12 ga rubber coated wire 3/4 " re bar frame, neoprene top . Very nice dome! Looks like it will last you a long time. Very interesting & important subject, keep it going!!!!!!!!!!!!!!!!!!!!!!!!!!!!!!!!!!!!!!!!!!! Last edited by Al Sanchez; July 3rd, 2015 at 10:33 AM. 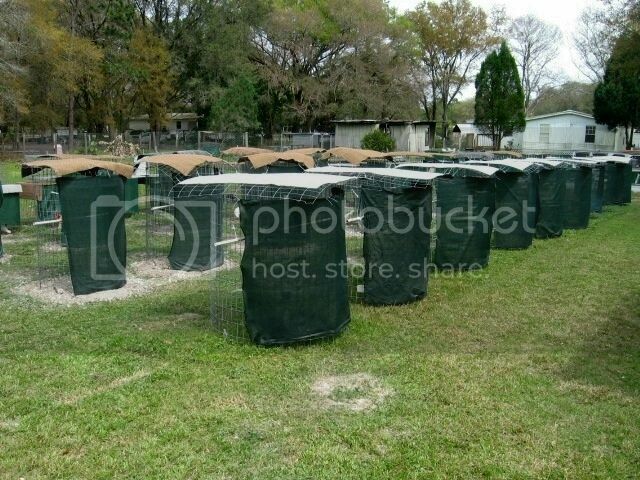 Yes please post pics of your round pen set up! How much wire/pen? How many pens/roll? How much/roll? Where can you find it? Last edited by Smoke23; July 30th, 2015 at 12:21 AM. I like these roundpens, like warparty, and Al has. but finding 14gauge welded wire with proper length and height has been an issue..
also a Tenax c flex heavy duty poly fencing..
Now that is what I call a Cadillac pen!